← Writer’s Block: myth or reality? I grew up in an enlightened, feisty, and intellectually engaged generation when women made the conscious decision to try to do it all – juggle intimacy, children and home life with career, profession, and advanced education. Words like “Women’s Lib (Liberation)” and “feminism” or “feminists” (words that were often spat at us) were part of the vocabulary of a Baby Boom generation that was coming of age. I’m sure I still have my 1976 “International Year of the Woman” pin (think Helen Reddy – singing “I am Woman….I am Invincible..”) and, although I did not burn my bra back in the day when that was very “de rigeur” (I needed the wire support), I did and still do consider myself a feminist. For some reason, people did not react well to that word. My response: get over it. 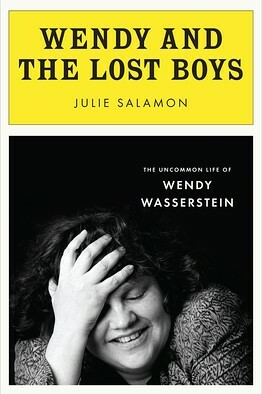 So, when I picked up Julie Salamon’s new book, “Wendy and the Lost Boys – The Uncommon Life of Wendy Wasserstein” – I was reminded of this intelligent breed of women who dared to cross the boundaries of gender and did so with grace, compassion andhumor. Wendy Wasserstein was the first female playwright to win a Tony Award. She also won the Pulitzer Prize for the “Heidi Chronicles.” Everyone in the Broadway circle knew this witty, intelligent and gregarious New York playwright who wrote about driven women and their struggle to balance ambition and achievement with the need for romance and companionship. Drawing from her own life experiences, she crafted characters who – with eloquence and wit – expressed the contrasting emotions of self-doubt, ferocity and yet also vulnerability. Like many luminaries before her, Wendy Wasserstein’s light went out too soon. She died in 2006, of lymphoma – at the age of 55. In Julie Salamon’s poignant portrait of the enigmatic Wendy Wasserstein, she reveals some of the unexpected and extraordinary nuances of this wonderfully complex character. This is a really, really good read. This entry was posted in literati and tagged Broadway, feminism, feminist, heatherfromthegrove, Heidi Chronicles, Helen Reddy, I am Woman, International Year of the Woman, Julie Salamon, Wendy and the Lost Boys, Wendy Wasserstein, Women's Liberation. Bookmark the permalink.